The American Academy of Podiatric Sports Medicine’s assessment test—which focuses on heel counter firmness, torsional control, and flexibility—can help in selecting a shoe that will be biomechanically effective as well as comfortable. The athletic shoe industry is primarily market driven. Athletic shoes are touted for their ability to help their wearers run faster, jump higher, and perform better than their competitors. Advertising campaigns for athletic shoes are all about color, environment, and feeling. The shoes endorsed by the best player in the National Basketball Association make you “play” better on the court or make you “feel” like you can run faster in shoes touted by the world’s fastest man. From the standpoint of a patient or a practitioner, it can be daunting to make a determination or recommendation of what shoe would be best for a patient/athlete to wear. How do you really know whether or why one shoe is better than another? Some running magazines regularly do evaluations of running shoes. Unfortunately, some of the tests suggested and utilized by these magazines are not fully supported by the scientific literature, or they are considered to be extremely subjective. 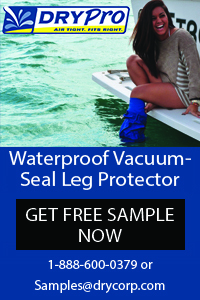 The “wet test” for example, is touted by running shoe catalogs and many running and health and fitness magazines as a way for a runner to evaluate his or her medial arch height or contour. This test consists of wetting the foot with water and then standing at full weight bearing on a paper bag or piece of paper to visualize the foot’s medial longitudinal arch contour. The arch type, as determined by the test, is supposed to help determine the type of shoe best suited for the runner. An athlete with a higher arch would be directed to a so-called cushioned or neutral shoe, one with a neutral arch to a stability shoe, and a low-arched runner to a motion control shoe. Figure 1. A running shoe should have a firm heel counter. The American Academy of Podiatric Sports Medicine utilizes a basic three-point testing methodology for evaluating athletic shoes. This evaluation process was developed by Mark Reeves, DPM, of Seattle and adopted by the academy board of directors more than 10 years ago. The academy teaches its members to perform this test and, in turn, instruct their staff and patients in it as well. Figure 2. The shoe should allow the foot to pronate and supinate as needed in response to positioning stresses. The focus of the testing is primarily on whether the shoe has a firm heel counter, whether the shoe has a firm resistance to torque when the heel and toe are twisted in opposite directions, and whether the most distal third of the shoe flexes easily while the middle third resists flexion. These techniques are all performed manually and can be done easily in shoe stores or in the office. The three-part test is quick and easy and provides objective metrics because it is repeatable and results can be compared from shoe to shoe. A certain amount of subjectivity is built into any type of manual evaluation, however, as different testers may have differing strength capabilities affecting their ability to flex, squeeze, or twist a shoe. The academy appreciates this, but at this time there is no other basic hands-on testing methodology available that provides a metric for comparing one athletic shoe to another, especially running shoes. All three components of the evaluation are grounded in evidence. A study performed to evaluate comfort related to the function of three types of shoes found that of the shoes evaluated, the shoe that was the most comfortable had the highest torsional stiffness relative to eversion, the most forefoot flexibility, and the greatest degree of hardness at the midsole.5 But the apparent advantages of those three shoe characteristics go beyond comfort. Heel counter strength evaluation and usefulness in controlling foot function can be debated, but a recent study showed that maximum rearfoot eversion angle, maximum calcaneal eversion angle, and maximum eversion velocity decreased significantly with the use of custom foot orthoses in running shoes that did not have heel counters built in.6 Stacoff et al, in a study of running shoes that did have heel counters, found that movement of the heel while running barefoot was similar but not identical to movement of the heel counter of a shoe.7 Extrapolating the barefoot movement to that of the foot within a shoe, the authors suggested that the heel inside the shoe moves less and more slowly than the heel counter of the shoe itself, and thus the shoe could be regarded as offering protection of the rearfoot. Torsion control in a shoe may play a more important role in sports in which lateral cutting is of primary importance. 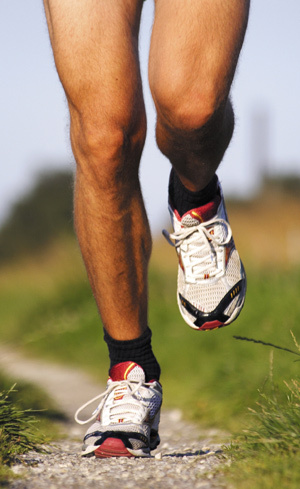 In court shoes and trail running shoes, for example, the foot is placed in very different positions due to varying terrain or lateral movements while running, jumping, and landing. 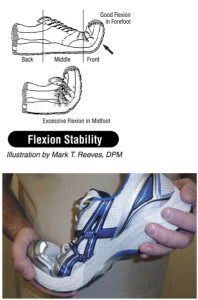 The shoe should be able to allow the foot to pronate and supinate as needed in response to these positioning stresses.8 In running shoes, an increase in motion-controlling properties built into a shoe often leads to a shoe that will be more resistant to twisting torque forces.9 This may be acceptable for most road-running on flat surfaces, but it won’t work in general for offroad running or other lateral cutting sports. Finally, we come to the flexion properties of the sole of the shoe. This is probably the most important factor in evaluating any type of athletic shoe. The AAPSM test involves evaluating the ease of flexion of the most distal third of the shoe as well as the flexion resistance of the middle third of the shoe. This component of the evaluation is the most significant departure from other methods of evaluating running shoes. Figure 3. 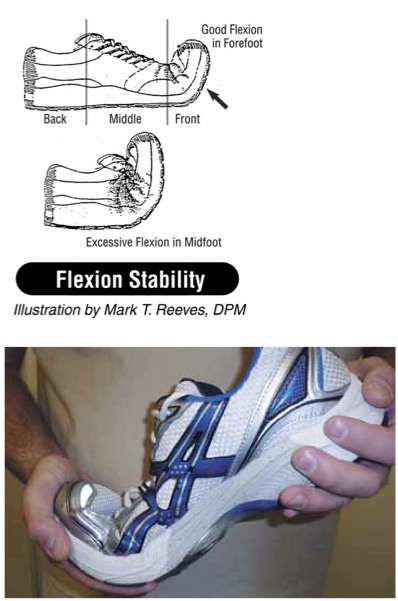 The most distal third of the shoe should flex easily while the middle third resists flexion. An athletic shoe’s ability to resist midfoot and forefoot compensations for subtalar joint and ankle joint pronation is of paramount importance. Athletic shoes must allow for progressive, unhindered rolling motion from heel strike through midstance and into active propulsion, or the body will begin to compensate at the ankles, knees, hips, and potentially the back. Although it can be difficult to determine whether one athletic shoe is better than another, there are several things to keep in mind. The athletic shoe industry is market driven. Many shoe tests touted by running shoe magazines and catalogs are not backed by scientific literature and are too subjective in their recommendations. The AAPSM suggests evaluating athletic shoes utilizing a basic three-point, hands-on assessment based on scientifically researched principles. Of particular importance is the flexibility of an athletic shoe in its distal third and the resistance of flexibility in the middle third. Shoes that meet these guidelines will, in general, work much better for athletic patients and can potentially minimize negative mechanical compensations in the feet and at higher levels of the kinetic chain. Bruce E. Williams, DPM, is a fellow and the immediate past president of the AAPSM. He is in private practice in northwest Indiana, where he specializes in sports medicine, biomechanics, and gait analysis. 1. Swedler DI, Knapik JJ, Grier T, Jones BH. Validity of plantar surface visual assessment as an estimate of foot arch height. Med Sci Sports Exerc 2010;42(2):375-380. 2. Knapik JJ, Swedler DI, Grier TL, et al. Injury reduction effectiveness of selecting running shoes based on plantar shape. J Strength Cond Res 2009;23(3):685-697. 3. Clinghan R, Arnold CP, Drew TS, et al. Do you get value for money when you buy an expensive pair of running shoes? Br J Sports Med 2007;42(2):189-193. 4. Subotnick SI. 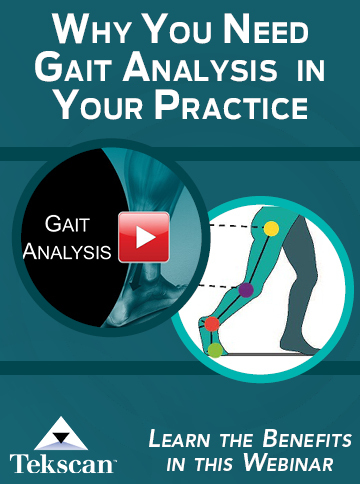 Clinical biomechanics—biomechanics of the foot and ankle. In: Sports medicine of the lower extremity. 2nd ed. Philadelphia: Churchill Livingstone; 1999:127-136. 5. Miller JE, Nigg BM, Liu W, et al. Influence of foot, leg and shoe characteristics on subjective comfort. Foot Ankle Int 2000;21(9):759-767. 6. MacLean CL, Davis IS, Hamill J. Influence of running shoe midsole composition and custom foot orthotic intervention on lower extremity dynamics during running. J Appl Biomech 2009;25(1):54-63. 7. Stacoff A, Reinschmidt C, Stüssi E. The movement of the heel within a running shoe. Med Sci Sports Exerc 1992;24(6):695-701. 8. Stacoff A, Steger J, Stüssi E, Reinschmidt C. Lateral stability in sideward cutting movements. Med Sci Sports Exerc 1996;28(3):350-358. 9. Stacoff A, Kalin X, Stüssi E. The effects of shoes on the torsion and rearfoot motion in running. Med Sci Sports Exerc 1991;23(4):482-490. 10. Kong PW, Candelaria NG, Smith DR. Running in new and worn shoes: a comparison of three types of chshioning footwear. Br J Sports Med 2009;43:745-749. 11. Stacoff A, Reinschmidt C, Nigg B, et al. Effects of shoe sole construction on skeletal motion during running. Med Sci Sports Exerc 2001;33(2):311-319. 12. Shorten MR. The myth of running shoe cushioning. Presented at IV International Conference on the Engineering of Sport, Kyoto, Japan, Sept. 2002. 13. Heidenfelder J, Sterzing T, Milani TL. Biomechanical wear testing of running shoes. Footwear Science 2009;1(S1):16-17. 15. Witana CP, Goonetilleke RS, Xiong S, Au EY. Effects of surface characteristics on the plantar shape of feet and subjects’ perceived sensations. Appl Ergon 2009;40(2):267-279. 16. Hall C, Nester CJ. Sagittal plane compensations for artificially induced limitation of the first metatarsophalangeal joint: a preliminary study. J Am Podiatr Med Assoc 2004;94(3):269-274. 17. Nester CJ, Liu AM, Ward E, et al. 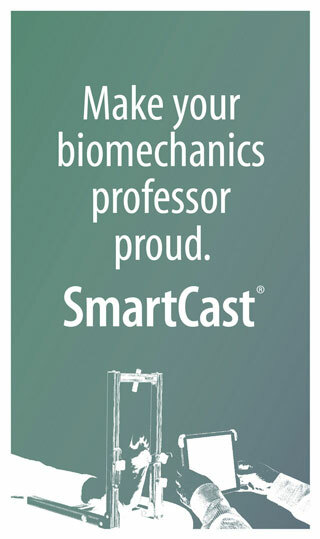 In vitro study of foot kinematics using a dynamic walking cadaver model. J Biomech 2007;40(9):1927-1937. 18. Nester CJ. Lessons from dynamic cadaver and invasive bone pin studies: do we know how the foot really moves during gait? J Foot Ankle Res 2009 May 27;2:18. 19. Lundgren P, Nester C, Liu A, et al. Invasive in vivo measurement of rear-, mid- and forefoot motion during walking. Gait Posture 2008;28(1):93-100. 20. Wolf P, Stacoff A, Nester C, et al. Functional units of the human foot. Gait Posture 2008;28(3):434-441. Great clues! An easy way to be sure that you’re buying the right shoes. Patients are going to love it!